I ran a Facebook experiment today to determine just how much Facebook contributes to whether or not you see updates from Pages. There has been an awful lot of talk about the “16%” of Fans who see your posts, and I think that we generally have overreacted to assume this means Facebook picks and chooses who sees what with their algorithm. The main reason that only 16% of Fans see your post is that they simply aren’t online at the time. EdgeRank, while it does exist, has very little impact on what you do and do not see. 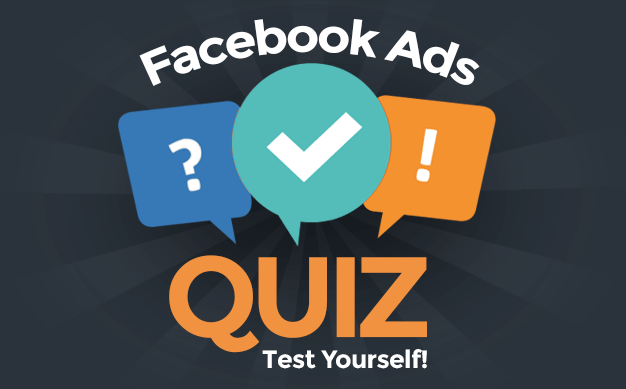 Those who do not see your Page posts due to Facebook’s algorithm are in the extreme minority. One day prior to running the experiment, I wrote this blog post and shared it to my Facebook Page, Twitter, LinkedIn, Reddit and Google+. I also sent an email blast to my subscribers letting them know of the experiment, and then I sent another email 15 minutes before the experiment began. I did this because I wanted to maximize the number of people who went to their News Feed and waited for the post as opposed to those who saw it naturally. I also wanted to make sure that people were informed on what I was doing so that I received as many accurate responses as possible. ALERT! This is my experiment! Click Like if you see this update. Please comment if you saw it in your News Feed or if you had to come to my Page to see it. Thanks! The goal was to have as many people knowledgeable of the experiment ahead of time as possible. I was looking to limit the number of people who weren’t informed and may have commented inaccurately without fully understanding what I was looking for. Within 30 minutes, my status update had received 75 responses. All but one of those responses said that they saw my update in their News Feed (one person said they saw it in their Ticker but did not clarify whether it showed up in their News Feed). I asked that one person whether they had their News Feed set to “Most Recent” or “Top Stories” since a setting on Top Stories could negatively impact the order of their News Feed for the purpose of this experiment. They did not respond. If 25 or more people actively and not passively participated in this experiment, I could potentially have accurate results. If, say, all but one of 25 people participated and saw my update in their News Feed as expected, that could mean that EdgeRank has little impact on what they see and don’t see. But I don’t know how many actively participated, which is a weakness in my results. Another weakness is the uncertainty about how EdgeRank works. Sure, we have a very general understanding. But is it real time? Was the experiment flawed because the likes and comments on my status update increased EdgeRank, thereby increasing the likelihood that Fans would see it? Since EdgeRank favors those who interact most with me, couldn’t we then assume that the vast majority (if not all) of the participants would be seeing my updates as a result of EdgeRank? All or close to all of the people participating in my experiment saw my status update. There is a concern that a positive EdgeRank (lots of people liking and commenting, among other factors) impacted this, but my assumption is that this is largely only when viewing News Feed by “Top Stories.” The point of Top Stories is for Facebook to determine “what is important” to you. This does not appear to impact a “Recent” sort much, if at all. If participants reacted immediately after my posting (and many did), I would not expect EdgeRank to have an effect on real time, immediate activity. Was this experiment scientific? No. Are there flaws in the process and findings? Sure. But does it provide some useful data? Absolutely. 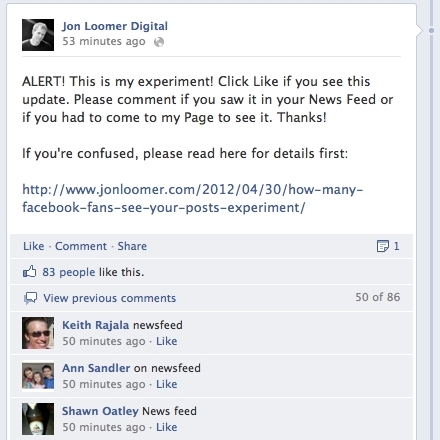 At most, one person participating in this experiment didn’t see my status update because Facebook kept it from them. That tells me that we need to stop whining about EdgeRank and Facebook keeping our Fans from seeing our content. It tells me that we have much more control over what content Fans see than we originally thought. The one thing we don’t have control over: Whether Fans see an update because they aren’t online. But that’s nothing to get angry over, now is it?